Phulka is a light and fluffy Indian bread. Usually Phulka is cooked directly on gas burner flame to make it fluffy. 1. Combine the flour, oil, sugar and salt in a large bowl. Sprinkle water a little by little while kneading the flour. Knead well and make a soft dough. Cover the dough and keep aside for atleast 2 hours. 2. After 2 hours, grease your hands with little oil and knead the dough again. Roll out in to small balls. 3. Then, using a rolling pin, gently spread the balls in to round thin discs. 4. 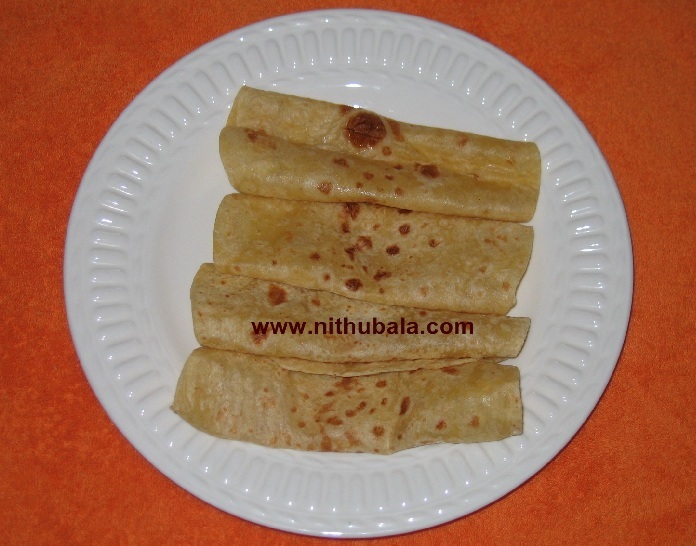 Heat a dosa pan. Place the phulkas. Once the phulka puffs up and the top portion starts to form bubbles, flip to other side and cook or alternatively you can cook one side on the dosa pan and other side directly on the gas burner flame. 5. Once cooked, apply little ghee and serve warm with any side dish. 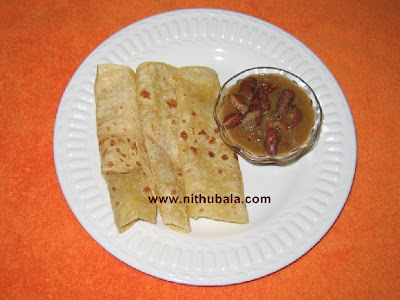 Simple phulka is always relished with any curry. HOw r u dear? nice and soft phulka. my fav. take care. Never tried Phulkas.. Urs look simple.. Would try soon..
looks so soft and fresh ! Lovely phulkas. We make them all the time but don't add the sugar or salt to the dough. looks so soft n nice!! Nithu, pulkas looks so soft and perfect..Also i add milk or curd to the dough mioxture..next time I'll make like ur's.. I've never combined wheat flour and maida Nithu! Pulka's look soft and yummm! Pulkas seem very soft! Very nice recipe! perfect phulkas nitu.. looks so soft..
Soft, shiny and perfect looking. good one nithu and the orange & almond rava kesari had me hooked !